Last week, I expanded upon my original post where I modeled a workflow as a Petri Net, adding in usability features such as an XML configuration and integration with WorkItems defined in Spring configuration. My goal, however, is to have a network of batch jobs be triggered off in response to a state change in my primary datasource. The only dependencies between the jobs is the order in which they must execute, and the order is specified in the workflow. I decided to use the event handling built into Spring. For the event publishers, all I needed to do is have the WorkflowItem be ApplicationContextAware (which exposes the getApplicationContext().publishEvent(Object) method to all its subclasses. The WorkflowFactory is the single event subscriber, and it does this by implementing ApplicationListener which mandates an onApplicationEvent(Object) method. This is off whenever the ApplicationContext has an event published into it. In the interests of not boring you to death, I reproduce only the code that is relevant to this post. If you have been reading my previous posts on this subject, I had to do some minor refactoring, such as the addition of a stop attribute in the XML to specify the end Place(s) in a network, and the removal of the old Workflow.traverse(boolean) method in favor of the event driven ones. You can probably make these connections yourself. In case you haven't read the previous posts, you probably only care about the event-handling stuff anyway, so the rest is unimportant to you. The first change is the introduction of the WorkItem layer to insulate the actual job from the Transition. This ensures that the programmer who writes the batch job does not have to worry about whether the job will run synchronously or asynchronously, and in any case, its a common concern, so it should be factored out into one place. WorkItem has two implementations, the SynchronousWorkItem (which can be used for testing the workflow itself, among other uses), and the AsynchronousWorkItem (which would probably be the one a client would mostly use). * the Workflow on completion. * Generic interface that all WorkItem Executors must implement. An example IExecutable implementation is the MockExecutable I use for my tests. The functionality is similar to the MockClosure I have been using in previous iterations. * Mock Executor that just prints a message and updates the _OK variable. * which wrap existing legacy classes. And here is how I hook all these things into the Spring Application Context. In the interest of brevity, only one definition is shown, the others are similar. The workflow-conf.xml is unchanged as a result of this change. 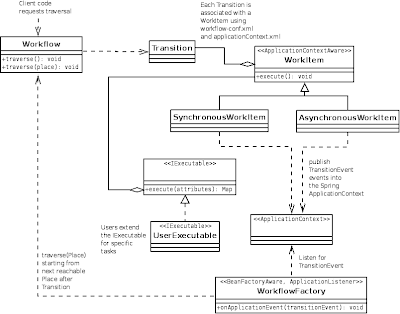 And finally, the listener in the onApplicationEvent() method of WorkflowFactory. Finally, to tie all this together (and to show how a typical client would call this thing), I have the following JUnit test, which does the event driven traversal. The traversal changes as expected. Since the traversal is now event-driven, there is now no need to tell the workflow which traversal algorithm to use, it is dictated by the completion events and the edge weights. The outputs (before and after introducing SleepyMockExecutable into the chain) are shown below. As I mentioned before, I used the built-in Spring event handling because I was using Spring anyway. In case you not using Spring, a very good alternative is EventBus, that provides an event handling mechanism similar to Spring and is annotation driven as well. Some sample code that I tried using EventBus is shown below, you can adapt it to use in the application above if you want. So what's next for me in the Workflow world? Surprisingly, not much. I was talking with a colleague, and he expressed (a valid, IMO) concern that I was burning cycles trying to build something for which stable, mature versions are already widely available in the open source world. So figuring out how to adapt one of these to my application would probably make more sense in the long run. I agree with his assessment, and I will do as he suggests. However, it was a fun three weeks, and what I have got out of it is a better understanding of how workflow engines work, and the issues that have to be dealt with. Hopefully this will help me make a good decision in selecting the right workflow engine for my application. Add support multiple workflows in the same application. Access work items defined as Spring beans from the workflow. Replace BSF with Java 1.6's built-in scripting. To do this, I had to refactor the code a bit, so I will provide all of the code once again so it is easy to follow along. There was also a bug in the breadth-first traversal which caused certain transactions to be fired twice, so that is fixed in the new code too. Bossa provides a GUI tool that allows you to draw a Petri Net representing a workflow and builds an XML configuration file from it. So if I had used Bossa, I wouldn't have to write this. Starting from XML is definitely a step forward, but it is by no means a panacea. I cannot over-emphasize the importance of drawing the Petri Net first. There are configuration issues that are quite hard to debug by looking at the straight API and the XML, but which are readily apparent when you look at the diagram. As you can see, multiple workflows are now supported from within a single XML configuration file. The XML configuration file is used to build a WorkflowFactory object. It started out as a standard Singleton Factory object, but since I converted this to Spring (see below), I just put the XML parsing code into the afterPropertiesSet() method, which is called by the Spring BeanFactory on startup. * in the application's classpath. Factory returns Workflow objects. * back to the factory. * @param name the name of the Workflow to take. * does not exist. Client must check for null. * can be used without re-initialization by the next client. * @param name the name of the Workflow to return to the factory. Since I also made quite a few changes in the other classes - PetriNet (now called Workflow), Place, Transition and Edge, to accomodate the changes to the application, they are also shown below in their current incarnation. * Add a Place object to the Petri net. * @param place the Place to be added. * @return the Place that was added. * initial Place object. A Petri net can have only a single start place. * This is the Place from which the traversal will be started. * @param isStartPlace true if this is the start Place. * Return a List of Place objects in the Petri Net. * @return a List of Place objects. * Add a Transition object to the Petri Net. * @param transition the Transition to add. * Returns a List of Transitions mapped into the Petri net. * @return a List of all Transition objects. * @param value the initial value (usually false). * Sets all the attributes in a single method call. * @param attributes the attributes to set. * first, so this parameter could be used to influence the ordering of the jobs. * to test without actually running any jobs, consider using a MockClosure object. * This method delegates to the recursive traverse_r(). * first, and if false, it will be traversed breadth first. * the weight of the edge separating the Place and the Transition. * @param place the Place from which to determine next fireable Transitions. * @return a List of Transition objects that can be fired from the Place. * Returns a List of Places which can be reached from the specified Transition. * and the neighboring Place objects. * @param transition the Transition from which to determine reachable Places. * @return a List of reachable Places from the Transition. * is not fired more than once. * @param place the starting Place from which to fire. * @param alreadyFiredTransitions a Set of already fired transitions. * Implements a depth first traversal of the Petri Net. * @param place the starting Place. * Models a Place node in a Petri Net. * Models a Transition node in a Petri Net. I don't think Edge has changed, but here it is again for completeness. * Models and Edge connecting a Place and Transition in a Petri Net. Since a Workflow would be "checked out" for a period of time, application code should not be able to access a Workflow while it is being used by another (or the same) component. So it exposes a take() method which will return a null Workflow if it is not found or if it is already "taken", and a give() method which resets the Workflow to its initial state and makes it available to the application when it calls take(). Client code must check for a null result from the take() call. The Bossa project used a unreleased version of Apache BSF, so I did the same, pulling in the nightly snapshot when I set it up. Java 1.6 already bundles a scripting framework, so I used that instead. That way users of this code don't have to mess with having to work with an unreleased version of a project. You can see the code in the Transition.evaluate() method. Our original design mapped a self-contained piece of code (modeled with a Closure) to each Transition. The Closure would operate on the state of the Workflow represented by its attributes map. This turned out to be too limiting, so we now map a WorkItem object to each Transition. The WorkItem is an abstract class (containing about as much state as our original Closure), but now can be extended as needed by the application. * the requirements of their workflow. * attribute to true to indicate to the Workflow that it completed successfully. * Test for testing XML configuration of a collection of work flows. The output of this test, as expected, is similar to the previous post's test. However, this code reflects the bug fix that checks to see if a process associated with a Transition has already been fired, and if so, does not fire it again. I am working on adding support for asynchronous WorkItem templates, but the code is not quite there yet, so I will defer the discussion of that till next week.